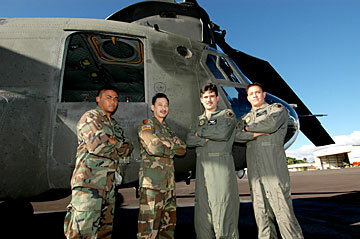 Members of the Hawaii Army National Guard's Charlie Company, 193rd Aviation, from left, Sgt. Shane Towers, Chief Warrant Officer Carlton Eto, Staff Sgt. David Buren and Chief Warrant Officer Steve Froeschle walked away from the crash of their CH-47 Chinook helicopter in Iraq. Hawaii Army National Guard Chief Warrant Officer Steve Froeschle says he and his crew walked away from the crash of his CH-47 Chinook during a sandstorm in Iraq because of advice given him by a fellow pilot and Vietnam War veteran. "When I got my wings, he (Chief Warrant Officer Oliver Kaloi) told me that the most important thing of being a good pilot is to never stop flying your aircraft -- no matter what the condition," said Froeschle, who has been a member of the Hawaii Army National Guard since 1990, after transferring from the Marine Corps Reserve. Kaloi's words came back to him during a Washington, D.C., awards ceremony last month as he stood with the Air Force crew who rescued him and his crew of four, Froeschle said in a recent interview. On April 15, 2004, Froeschle with his crew of four were part of three CH-47 Chinook helicopters from the Hawaii Army National Guard's Charlie Company, 193rd Aviation, on a resupply mission when he found himself in a blinding Iraqi sandstorm. Froeschle was the pilot in command of the Chock 2 -- the second Chinook in a flight of three. It was his third mission since arriving in Iraq on Easter Sunday 2004. "I never saw anything like that before," said Froeschle, who since 1988 has been a member of the Honolulu Police Department. Since returning in March after spending a year in Iraq, he has been an instructor at the police academy. "Even before we took off, walking to the aircraft, the wind was so strong and bad that the blades (of the helicopter) were turning," said Froeschle, who has been flying Hawaii Army National Guard Chinook helicopters for the past 13 years. Forty-five minutes into what supposed to be a routine four-hour night resupply mission, Froeschle said the flight of three helicopters ran into "a wall of dirt and dust ... It was extreme weather like nothing I have ever saw before." The crew members included crew chiefs Sgts. Shane Townes and Roxanne Shim; all were equipped with night vision goggles. Shim is the Hawaii Army National Guard's only female crew chief. Staff Sgt. David Van Buren, flight engineer for the mission, was one of two gunners manning M-60 machine guns on each side of the helicopter. His position was on the left side of the Chinook. "Our job was to search for enemy activity," said Van Buren, a 1992 Leilehua High School graduate. The three Chinooks were flying about 300 feet above the ground, going about 140 to 150 knots to avoid insurgent rocket and ground attacks near Kharbut. Froeschle's Chinook was in the middle of a three- aircraft formation. Chief Warrant Officer Carlton Eto, who has been flying since 1990, had the stick and was flying the Chinook. "It went from bad to worse in minutes," said Froeschle. The lead helicopter, which was off to the left of Froeschle's Chinook, made an unexpected right turn, forcing Eto to make a responsive evasive movement to avoid a possible collision. This CH-47 Chinook helicopter went down in a sandstorm in Iraq in April 2004, but the Hawaii crew survived unscathed. At that point, Froeschle said, Eto reported over the Intercom, "Zero, Zero," meaning that he had zero visibility and zero reference to anything outside. Froeschle said his Army training kicked him and he took over the controls of the 32,000-pound helicopter as it turned right to avoid the other helicopter. Froeschle said one of his concerns was the other Chinooks in the formation. "I wanted to avoid a mid-air collision at all cost," said Froeschle. At that point, Froeschle said he could see the ground through his night vision goggles as he attempted to land in a waddy or dry river bed. 'I kept thinking that even if I bounced off the ground," Froeschle said, "we could walk way from it ... I just didn't want to stall and then run into one of the two helicopters above me." Froeschle said the Chinook hit and then bounced. However, at the time, about 2 in the morning, he didn't know the impact had sheared the right rear landing gear. 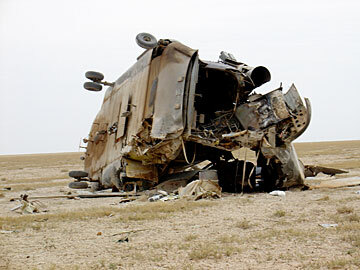 "We rolled to the right," Froeschle said, "the rotor blades impacting on the ground, and we ended up on our right side." The radios on the helicopter were out, so Froeschle transmitted a Mayday distress call on a hand-held transmitter. At that point the Chinook was on fire as Froeschle as his crew of four assembled away from the downed bird. "I asked everyone to physically check themselves out," Froeschle said. "Everyone kept saying they were okay. That was such an incredible feeling." Back at Balad air base, 50 miles north of Baghdad, the crews of Air Force Capt. John Bryan Creel's Jolly 11 and Capt. Rob Wrinkle's Jolly 12 combat search and rescue teams were on duty, prepared to respond. The crew members belonged to the Air Force's 38th Rescue Squadron and 41st Rescue Squadron, both of Moody Air Force Base, Ga. The rescue the two crews would perform that night earned them one of the Air Force's most prestigious awards, the 2004 Air Force Clarence MacKay Trophy. After picking up the survivors, the Air Force rescue crews had to figure out a safe way to get out of the sandstorm, said Capt. Rob Wrinkle, who was aircraft commander of Jolly 12. Again, because of low visibility, the two helicopters separated until they were clear of the sandstorm, Wrinkle said. As soon as the aircraft met back up, they began to take rocket-propelled-grenade and missile fire from insurgents on the ground, Wrinkle said. At that point, Froeschle looked at Eto, who was on the same Air Force rescue helicopter, and both said they couldn't believe they had been through so much to be shot down while helplessly strapped into a rescue helicopter. Eto, a 1982 Pearl City High School graduate, said the incident helped him "to refocus and showed me gaps in our operations. After that, we streamlined our operations and put more emphasis in our pre-mission planning." Townes, a 1997 Leilehua High School graduate, said he was back flying within a week. "It ratcheted up my situation awareness couple of levels." Van Buren passed up a promotion to sergeant first class to keep flying. "I was anxious to get back out." Froeschle said the advice Kaloi gave him years ago rang true throughout the whole incident. "Never stop flying," he added, "no matter what the conditions. That is what me and my crew did. No one lost their head and stopped flying."